There were a couple of leaks this past week about an Active variant of Samsung's Galaxy S7 flagship. 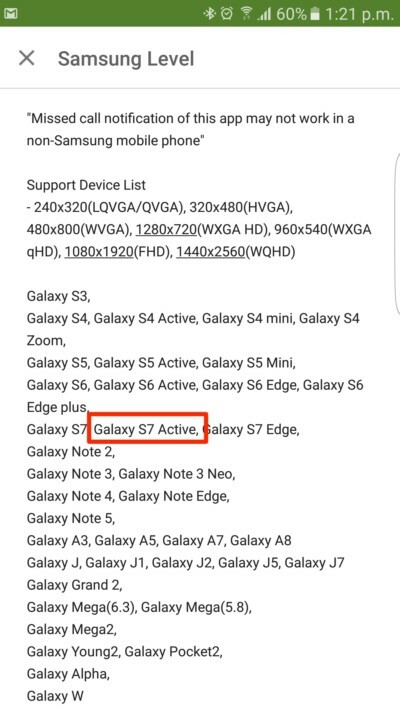 Now, the name 'Galaxy S7 Active' has been spotted listed in the change-log of Samsung's Level app, effectively confirming the existence of the device. For those who missed, the Galaxy S6 Active successor was first spotted in a Zuaba listing carrying a model number of SM-G891A (GS6 Active is G890A). Then, a couple of days later, the usually reliable leakster @evleaks revealed that the device has a code name of Poseidon, and is being tested at AT&T. As for how the rugged version would be different from the standard Galaxy S7, it is being speculated that design will be a differentiating factor. Plus, there will be military-grade protection (MIL-STD-810G) from scenarios like drops and falls, and not to mention a larger battery. Samsung need to do Samsung Galaxy S7 Active with 5.3"inches and 4K display screen, and everyone need this monster smartphone!!!!!! !